The Apple Watch, AirPods, and some other Apple products will be exempted from a proposed $200 billion tariff on Chinese goods, reports Bloomberg. An updated list of products affected by the tariffs is expected to be released today, and it will not include a product category that covers Apple Watch, AirPods, and other smart watches and fitness trackers. Five separate sources have confirmed to Bloomberg that the Trump administration will exempt many of Apple's products. 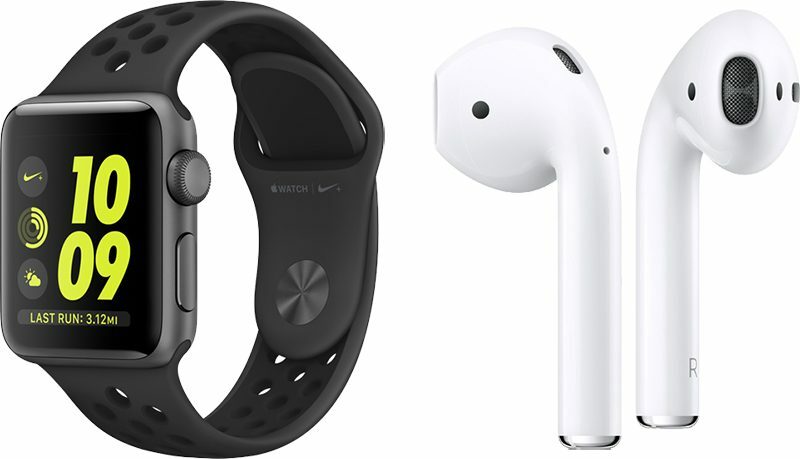 A preliminary tariff list released earlier this year did include wireless devices like the AirPods and the Apple Watch, and Apple in early September said that several of its products would be affected. Apple sent a letter to the Trump administration urging it not to apply the tariffs that would affect Apple products, asking the government to instead find "other, more effective" solutions. Apple said implementing the tariffs would lead to lower U.S. growth and competitiveness, along with higher prices for U.S. consumers. Back in July, Apple CEO Tim Cook commented on the tariffs, saying that Apple was "optimistic" the issue would be sorted out, with the company hoping "calm heads prevail." This fourth round of tariffs will cover $200 billion in Chinese goods and it joins several other tariffs that have already been put in place on products like steel, aluminum, and billions of dollars worth of goods. Update: The new list of tariffs has been released and Apple's devices are indeed excluded. So the most valuable company will be exempt, but smaller companies will have to pay. Cool. But Trump will increase taxes on everything else, punishing the poor and the elderly on fixed-income the most, since they rely on commodity imported goods the most. This is how Trump and the Republicans punish Americans - by raising prices for everything. Trump will squeeze every last penny out of you! The hypocrisy knows zero bounds. Just make it all up as you go! Trump probably figured out the raising taxes needs on highly visible products isn't a good look, so he's going to raise taxes on less visible products instead. Protectionist policies are actually very much a left leaning view and something not many Republicans agree on (unless you count using increased tariffs as a means to end them). If the goal is to use them as negotiating leverage to lower tariffs on both sides, I think it makes more sense. Hogwash. Protectionism stopped being a left-right issue nearly two decades ago. Everyone embraces free trade now...except for when it doesn’t suit them financially or politically. Kind of a "no sh**, Sherlock" situation, given the U.S. has no capability to build these products. There's not even a single OLED plant in the country. How the heck is Apple supposed to comply? It would be like placing tariffs on McDonald's unless they agreed to make burgers out of unicorns instead of beef. I support the tariffs against China. If American consumers aren't willing to pay a little extra to distance themselves from cheap Chinese slave labor while China continues to economically cheat, steal American intellectual property, and steal American technology, then they deserve to lose their place in the world. A lot of people don't realize it, but China is at war with the west and wants to surpass the United States by any means possible. They are patient and methodical. A world where China is the most powerful country in the world has profound implications on digital freedom and privacy and human rights in general. In Xinjiang China is putting hundreds of thousands of minorities in concentration camps. (d) Tim showed Donald some pee-pee pictures taken on an iPhone.